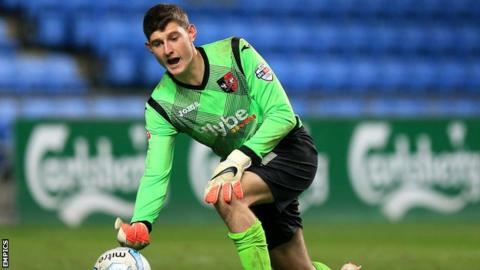 Exeter City goalkeeper James Hamon has described making his debut for the Grecians as "the best day of my life". The 19-year-old made his first start for Exeter in their 3-1 Johnstone Paints Trophy loss at Coventry City. "It was probably the best day of my life and one of the best experiences ever," Guernsey-born Hamon said. "At times it was unreal and I just had to think 'I'm here, I've just got to do what I do, it's just a game of football'," he told BBC Sport. "There were a few nerves earlier in the week, but as soon as I got over them I was fine," said Hamon, who came to the club from Guernsey FC having never played for an academy side. "I was really looking forward to it earlier in the week and in the build-up to it as well. "I was expecting to be a lot more nervous than I was, but overall I was just very excited to be there." And Hamon says the crowd of over 7,000 was a different world from the match which had previously been the biggest in his career, an Under-21 encounter between his native Guernsey away at their bitter Channel Islands rivals Jersey. "But it's something I love doing and hopefully I'll have the chance to play more games in the future."